J/News Articles: Breault Takes 3rd US Women’s Match Race Title! (San Francisco, CA)- Nicole Breault ran the table at the 2018 U.S. Women's Match Racing Championship, hosted by St. Francis Yacht Club, August 24-26. Without a single loss, Breault and her St. Francis Yacht Club (StFYC) crew of Molly Carapiet (San Francisco, Calif.), Hannah Burroughs (San Francisco, Calif.) and Karen Loutsenheiser (Santa Cruz, Calif.) successfully defended their 2016 title. Allie Blecher (San Francisco, Calif.), sailing with Ali Blumenthal (Bethport, N.Y.), Beka Schiff (San Diego, Calif.) and Molly Noble (Hood River, Ore.) for Cal Sailing Club, fought hard for second in a tiebreaker semi-final against Janel Zarkowsky (Annapolis, Md.). "It was the frosting on the cake, to have run the table, but it wasn't my expectation. I knew either Allie and Janel, coming out of the semi-finals, would be tough. We had to be ready," said Breault. Breault, along with Carapiet and Loutsenheiser, also won the Allegra Knapp Mertz Trophy in 2015. With the win, Breault is invited to compete at the 2018 U.S. Match Racing Championship, hosted by the Chicago Yacht Club on October 19-21, 2018. She had already qualified to represent the U.S. at the 2019 Nations Cup Grand Final. Breault is the #1 ranked women's match racer in the country and #8 in the world. 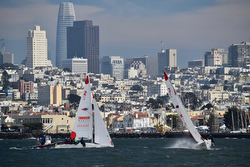 Blecher's team said they were enjoying the bay's breeze-on conditions and sorry to see the Race Committee remove spinnakers when the wind reached upper limits, "though it was the right call," said Blumenthal. "I should have waited but my heart was racing and I knew what was on the line," Zarkowsky recounted. "We're glad we gave her a hard time and we're glad she'll be at the Nations Cup." The light, shifty winds settled into a steady 15 knots heading into the final, where the first race was a textbook example of Breault and her crew's prowess. Blecher had the better start and a solid lead, but Breault clawed up her back, tack for tack, eventually seizing control and owning the first rounding. Her dialed deck crew had the spinnaker set and filled to lock in a solid lead they held to the finish. "We've got to be really aggressive," Breault said of her mindset on that first upwind. "We initiated a tacking duel and we knew were tacking better and gaining. It was like, 'We're behind, let's fight right now.'" "As soon as I saw her spinnaker collapse the second time, I knew we were going to reel her in," said Breault. "But it's always a struggle. We'd come out of the jibe at a crazy angle and the kite would pop and we'd ratchet forward a couple of feet." Breault capitalizing on every micro error, took down Blecher in three races. "I felt like we were a triple threat. We had a clear advantage, being in home waters, sailing as an experienced team in boats we know," said Breault. "They gave it their all and did good match racing. From the grassroots women's sailing standpoint, there was a really good vibe. There was camaraderie among competitors and it bodes really well for the regatta going forward." Blecher was awarded the Mrs. Charles Frances Adams Perpetual Trophy, and as the top finisher of the event who hadn't previously qualified for the Nations Cup, she will be nominated by US Sailing to participate in the 2019 regatta, also hosted by St. Francis Yacht Club. "We had potential, we just lost to them upwind. We just don't have the time together in the boat," said Blecher. "It was nice to spice things up at the starts and it was definitely fun racing." The U.S. Women's Match Racing Championship was sponsored by Gill, with prizes for top finishers provided by Hobie Cat and gifts for the umpires from Cameron Hughes Winery. Randy Smith conducted a match-racing clinic with the participating sailors on Thursday, August 23. Previous winners of the U.S. Women's Match Racing Championship include an impressive list of the top women's sailors in recent U.S. history. Cory Sertl, Betsy Alison, Sally Barkow, Anna Tunnicliffe, Stephanie Roble, Genny Tulloch, Liz Baylis, and Debbie Cappozi have all won this US Sailing National Championship.